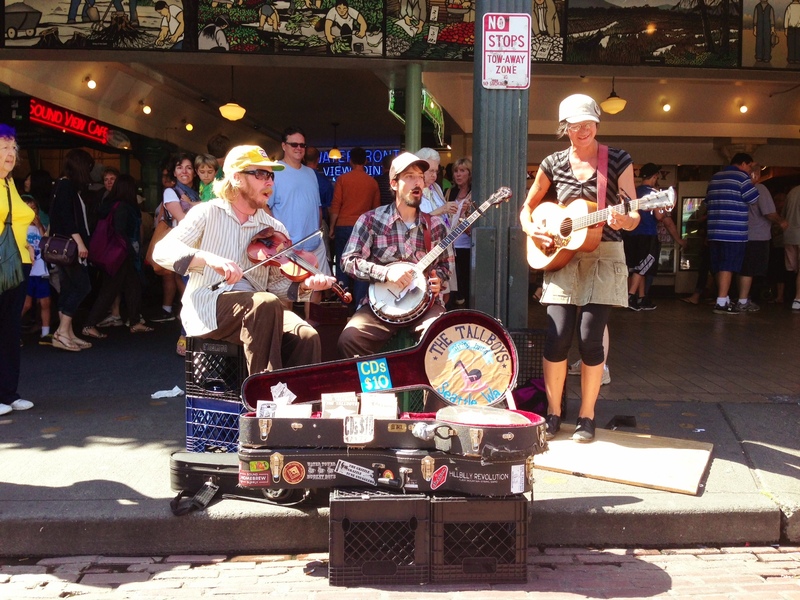 “The Tall Boys” play Pike Place Market, my favorite buskers! Hey Ron & Ashley, you don’t have to head to Tennessee to get great American music, just head to our market! These are “The Tall Boys”, bluegrass-country fiddlers & bango playing singers with washboards, cowbells, singing and clog tapping good times! The best! I’ll get you one of their CD’s and you’ll feel right at home when you ARE home. Now I’m a fan of all musical genres, what with Tyler being a musician and exposing me to virtually the entire encyclopedia of all things music, but these guys have that intangible thing going for them that you can’t contrive…”feel good-forget your woes-smile and take yourself out of the blues good time’s vibes”! Only at Pike Place Market, right after breakfast at Lowell’s! Agreed! I hope they will consider playing at the 2014 International Buskers Festival in Victoria this July – that would really round out a great time!